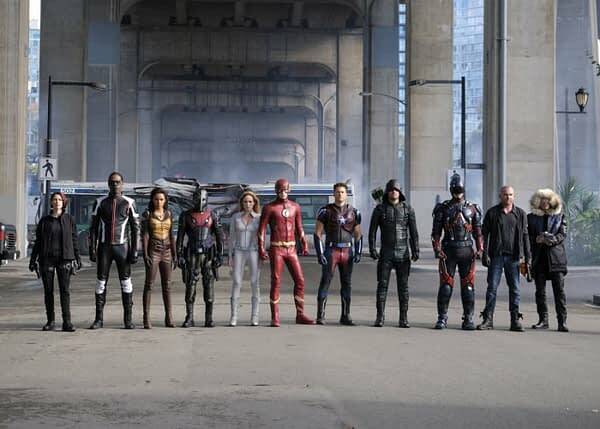 “Two Earths, two nights, too many heroes to count.” That might not be the official tagline for the CW’s four-show Arrowverse crossover event, Crisis on Earth-X, but maybe it should be. Caity Lotz says that in the teaser trailer for the event that kicks off tonight at 8 PM. Though it starts with an episode of Supergirl and then Arrow, the story is about all of the heroes coming together for the wedding of Barry Allen (Grant Gustin) and Iris West (Candice Patton). And in the tradition of most superhero comic weddings, bad guys show up to ruin the day. In this case, the bad guys are Nazis from Earth-X, the 53rd parallel Earth where the Nazis won World War II and now had metahumans and vigilantes like Overgirl, Dark Arrow and Dark Flash on their side. The clip gives us a bit more footage than we had before and includes Alex Danvers (Chyler Leigh) talking about how punching Nazis was as satisfying as she imagined it would be. The big push here is of course to remind viewers that the event starts tonight and continues tomorrow night at 8 PM with episodes of The Flash and DC’s Legends of Tomorrow. If you’re a fan of one of the shows you’ll likely want to tune in for all four this week as they writers have shown in the past that just because it’s a crossover, it doesn’t mean main story point won’t continue to happen. Stephen Amell has already talked about the focus on Oliver Queen’s relationship with Felicity Smoak (Emily Bett Rickards), the Barry and Iris relationship and the relationship/partnership between Martin Stein (Victor Garber) and Jefferson Jackson (Franz Drameh).